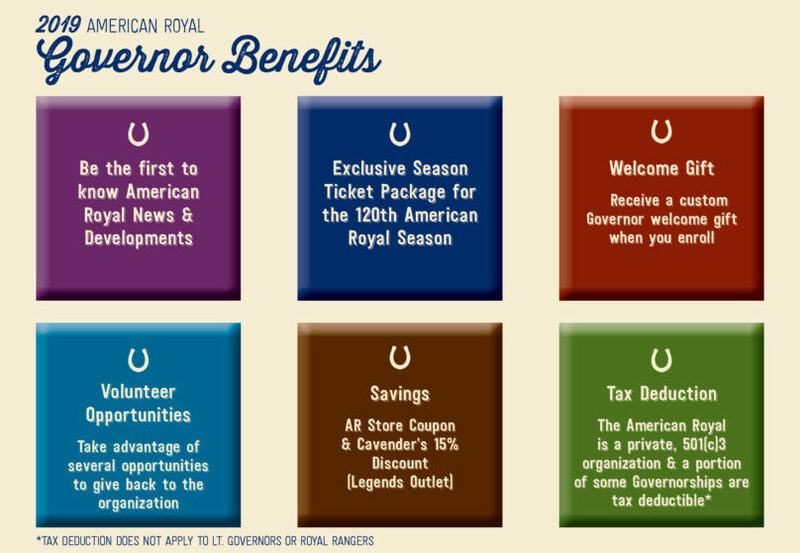 At the American Royal, Governors are both members and individual donors. The Governors Program is an annual membership, and a great way to connect with the Kansas City community while impacting the future of agriculture. 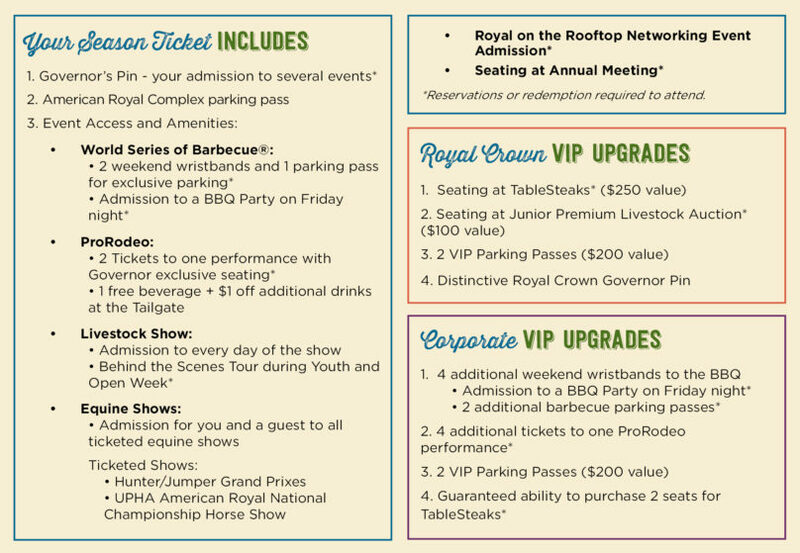 As a Governor, you'll enjoy benefits throughout the year including advance notification of American Royal news and developments, an exclusive season ticket package, networking and volunteer opportunities, and much more. Additionally, by being a Governor, you are directly supporting American Royal scholarships and education programs, which provide over 100 scholarships and reach over 18,000 students annually. Packages are available for individuals, businesses, families, young professionals and even kids. 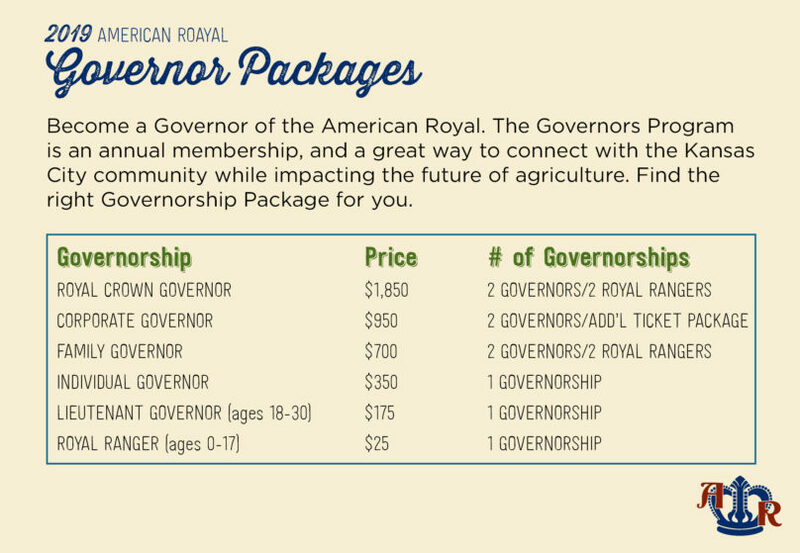 Become a Governor: impact the future of agriculture and join the excitement and fun at the American Royal! This year the American Royal celebrates its 120th anniversary as a cornerstone of educational and economic impact for Kansas City, the Midwest, and our country. To celebrate we developed a Corporate Governorship package. This new Governorship package allows organizations to get involved and take part in all of the exclusive networking opportunities, events, and community involvement surrounding the American Royal. See Governor Benefits for more details. Difficulty Enrolling Online? If you need assistance completing your enrollment, please contact Jessica Wright at 816-569-4030.